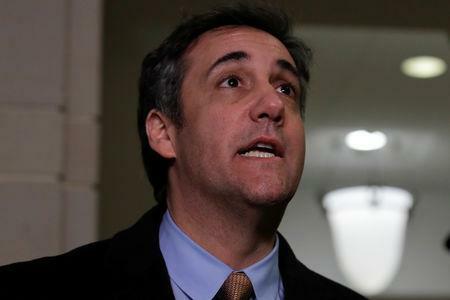 WASHINGTON/NEW YORK (Reuters) - U.S. investigators sought warrants to read Michael Cohen's emails in July 2017, nine months before the FBI raided the home and office of President Donald Trump's former personal lawyer, according to documents made public on Tuesday. The requests were made six months into Trump's presidency. Emails were sought by Special Counsel Robert Mueller's office as well as by the FBI, dating back as far as June 2015, according to the documents. Mueller is investigating Russia's role in the 2016 U.S. election and possible coordination with Trump campaign members. The nearly 900 pages of documents released by a federal judge in New York provide more detailed accounts of Cohen's financial relationships than previously known. Cohen had been Trump's personal lawyer and self-described fixer for more than a decade, but began cooperating with federal investigators soon after the April 2018 raids on his home, office and hotel room. Lanny Davis, a lawyer for Cohen, said in a statement on Monday night that the document release "only furthers his interest in continuing to cooperate and providing information and the truth about Donald Trump and the Trump organization to law enforcement and Congress." Since pleading guilty, Cohen has publicly turned on Trump, telling the House Committee on Oversight and Reform on Feb. 27 that his former boss was a "racist," "con man" and "cheat." In his congressional testimony, Cohen said he was "ashamed of my weakness and misplaced loyalty, of the things I did for Mr. Trump in an effort to protect and promote him." Cohen began working for Trump in 2007. The Republican president in December called his former lawyer "a rat" and in January said Cohen was "lying to reduce his jail time." The newly released documents showed how the FBI made extensive use of its access to Cohen's Apple iCloud account, which allowed him to coordinate his work across such devices as an iPhone, iPad Mini and laptop. FBI agents said they located a hotel room in New York's Loews Regency Hotel where Cohen was staying by using a device known as a Triggerfish that mimics cell phone towers to find a specific device. Among the payments Cohen was believed to have received was $600,000 from AT&T Inc for consulting about "political issues, including net neutrality, the merger between AT&T and Time Warner and tax reform." Republicans in Congress have criticized Cohen's consulting work, arguing he should have made his contracts public through disclosures. The warrant does not appear to detail any violations to lobbying disclosure laws.